Our favorite Nuclear Man was discussed at the San Diego Comic-Con this past weekend! 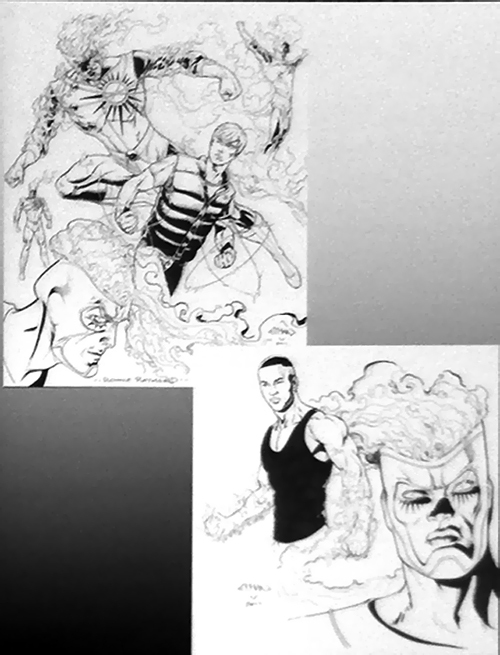 During the DC Comics: Designing the New 52 panel on Sunday, two concept pages by Ethan Van Sciver were shown (see below). Jim Lee said that Fury of Firestorm co-writer Ethan Van Sciver, an artist himself, had an idea in mind for the designs – what shows up in the comic is 99.9% his [Ethan’s]. Later during the DC Comics: The New 52 panel, Gail Simone spoke about Firestorm. Gail said, that we find out that there are Firestorm protocols across the world, so this will be a worldwide book. Additionally, there will be a new villain named Helix. He’s what happens when nuclear power goes wrong. Finally, the only Firestorm-related cosplay I’ve stumbled across so far was of Killer Frost. The model is known as Kiwi5Frog and you can see more of her Killer Frost cosplay by clicking here. So… may be many Firestorms? Helix? … discuss! My thanks to Brandon Leonard for directing me towards that Firestorm concept art by Ethan Van Sciver. Thanks, Brandon! UPDATE: For further Firestorm coverage from the 2011 San Diego Comic-Con, click here. Posted in: Comic books, Cosplay, Ethan Van Sciver, Firestorm #09: New 52 v1 (Firestorm Protocols), Firestorm comic vol. IV, Gail Simone, Jason Rusch, Killer Frost, Ronnie Raymond. i am a hugeee EVS fan so in him i trust….cant wait for the inevitable EVS drawn issue(s) of fury of firestorms those are going to be amazing pages!! @kiwki5frog…great job of the cosplay!